Back in the 1950's the mayor of Chateauneuf-du-Pape banned flying saucers from landing in the village - and in its local vineyards, for fear of damaging the grapes. 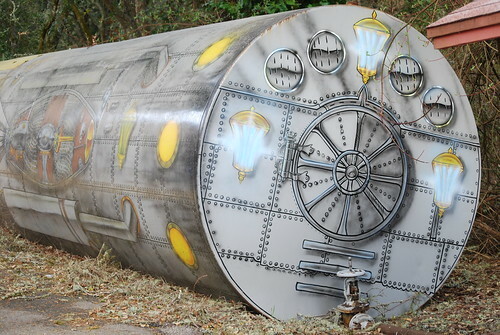 The winemakers at Boony Doon in the Santa Cruz mountains aren't so sure that UFOs are a problem for wineries, so they've called one of their best known wines Le Cigare Volante, and adopted a steampunk UFO as part of their brand image. Never knew that, even for the three months I lived there in 1982!